Oh joy! I have an empty house for the morning so I can get on with a few craft projects. (This is what's in my in-tray currently.) With any luck I can finish a few things and maybe get the lining for a couple of bags sorted too. Everything takes much longer when there is a pre-schooler running around, asking questions and requiring potty-breaks or negotiation. I like it when I have an uninterrupted few hours ahead of me so I can concentrate. Sadly though I seem to have forgotten how to do this. Another casualty of mummy-mind I guess. Yay - my sea glass cufflinks are on the front page (top row and on the right)! 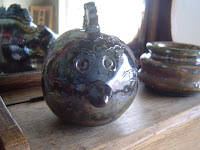 At last, I've tried raku. 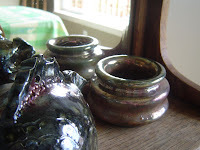 No, it's not an exotic raw fish dish or a method of alternative healing (tho' I've noticed DH referring to our new works of art as reiki) - it's a way of glazing and finishing ceramic work. Once we had finished painting the blanks provided the actual glazing part took place in a gas-powered kiln and then bins of shredded paper to finish off. V dramatic! The wee guy picked a rather splendid fish and went for a much more mundane but functionally useful pot "for putting things in" (and hopefully keeping me more organised in an aesthetically pleasing way). Both came out looking amazing. At long last I can knit an i-cord! I've been knitting since about the age of 10 years old and only found out about i-cords last year. 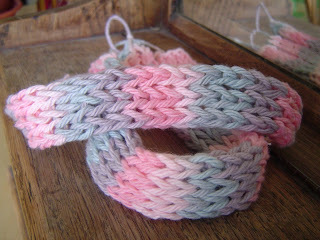 Finally I found instructions that actually made sense so I've knitted an i-cord (see above for results). This is going to revolutionise my felted bag construction in A Big Way! .... and for those of you as mystified as I was, an i-cord is a tube knitted on straight needles. The wee guy and I went to Family Place this morning for the drop-in play session. I love this playgroup as it has toys for the little people and full strength coffee and chat for the grown ups. We had lunch there and then left for some grocery shopping. Driving east along Prairie I noticed some strange red rings drawn in the road - then I realised. This is where Jason was knocked down and almost killed by a dark SUV last Tuesday night. The red marks started at the intersection which he and his mother were crossing that night ...... and they go on almost to the next intersection. In other words 'evidence' was carried almost a whole block. Jason is four years old, a little older than the wee guy above is now. He was on his bicycle at the time, which places his head at roughly bumper height I guess. He is a regular at Family Place and has played with the wee guy many times. There's more info in these two links, and also details of a trust fund that has been set up by his uncle. He's still in hospital, unconcious with brain damage and a broken leg. The driver of the dark SUV did not stop at the time of the accident and has still not come forward. ... and now for something completely crafty! Just finished industrial aluminium bracelet on the left (chainmaille boxchain weave with strung haematite beads) to compliment the industrial aluminium necklace above (chainmaille byzantine weave strung with haematite and blackstone, gorgeous dichroic fused glass cabachon pendant from lis kidder . - I earned approximately 24 new hearts (two of them anonymous), 25 convos and one sold item (thank you). Might write more about the whole darn thang when I can be a bit more coherent. Meanwhile, let me leave you with this thought - the Etsy sellers are an awesome bunch. Cheers to you all and big hugs for helping me last Tuesday. .. and PS: I am possibly able to have the last laugh after all. For winning the beading challenge (see post below this) Etsy will be sending me a prize goodies package ho ho ho! 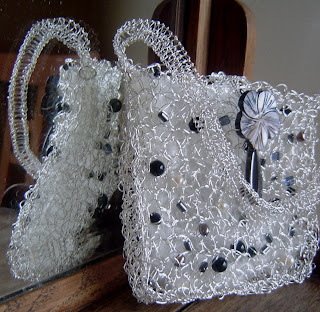 my wire crochet evening purse won the "anything goes" category in the winter beading challenge run by Victoria of http://beads4you.etsy.com . 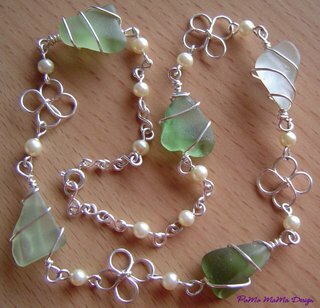 she sent an incredible selection of 'winter garden at dusk' beads, including glass, shell, haematite and pearls, out to a number of Etsy sellers with the challenge to create something original. two categories were available, 'only the beads' for just using the beads and findings, and 'anything goes' for, well er anything goes! click on the title of the post for a link back to all the competition winners! it was a great competition to take part in and amazing fun. 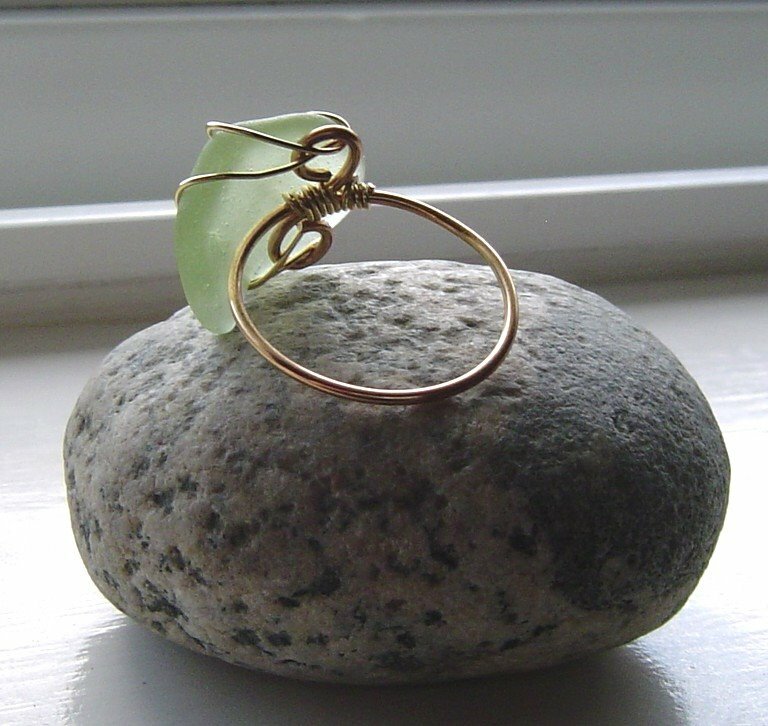 The seaglass is the reason why I started making jewelry (again - tho' my earlier attempts were back when I was in school and using Das modelling clay for beads!!) 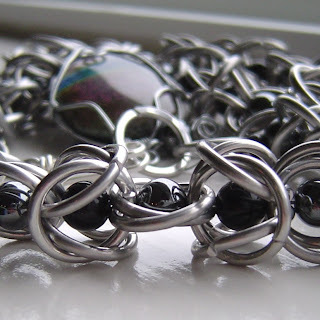 and wire wrapping in particular. 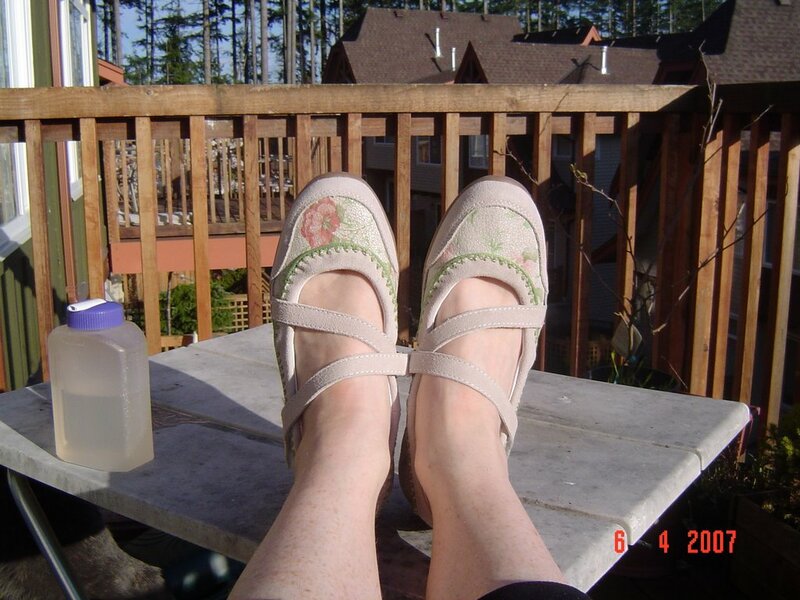 I grew up in a small seaside village and spent many a happy hour or several on the beach. First I collected shells and then I moved on to admiring the chunks of seaglass that get washed up. Now that I'm thousands of miles away from home and family these frosted gems meant a lot more to me. The wire wrapping also coincided with motherhood and in particular, the grabbing fingers of a curious toddler. As I emerged from my woolly new mum haze I started to wear more jewelry again. In one week I "lost" several necklaces and beads. Wire wrapping and more secure stringing seemed the only way to go, and I might be able to create something that would keep my precious seaglass close to me. 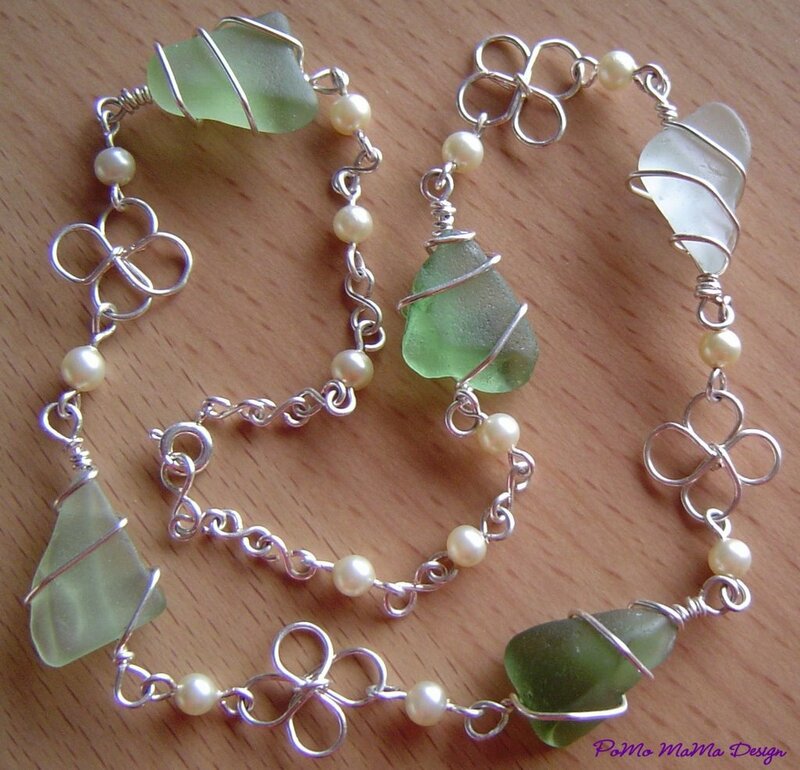 The necklace above was my first seaglass wrap and it is still holding up well to daily life! Since then my wrapping techniques have developed and evolved. There are some examples on my flickr site (see link below). Uploaded an image and also updated my profile. 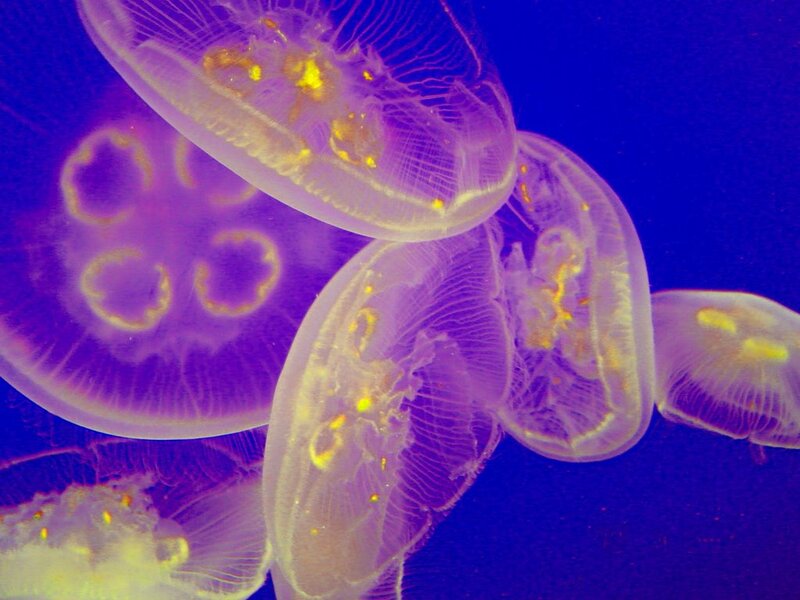 Not much else to say except enjoy the jellies! 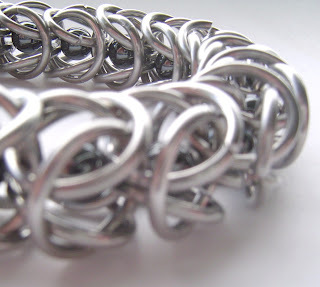 PS: I've also added a couple of viewers so you can link directly to ebbandflo shop and pics. Enjoy the views.